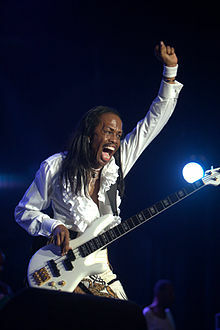 Verdine White (born July 25, 1951) is an American musician, best known as being the longtime bassist for Earth, Wind & Fire. White was placed at No. 27 on Bass Player's list of The 100 Greatest Bass Players of All Time. Verdine was born Verdine Adams in Chicago, Illinois, on July 25, 1951. His father, Verdine Sr., was a doctor who also played the saxophone. He grew up listening to recordings of Miles Davis, John Coltrane, and other jazz musicians. He was also influenced by his two drummer brothers, Fred and Maurice White, the Motown sound, and the Beatles. When he was 15, he saw a Double bass in his high school orchestra class and decided that he wanted to play bass. He soon got a red electric bass and, taking the advice of brother Maurice and his father, took private lessons from Radi Velah of the Chicago Symphony Orchestra, learning the Bille double bass method[clarification needed], and on weekends learned the electric bass with Chess Records session bassist and trombonist Louis Satterfield, who would later become a member of Earth, Wind & Fire’s famed horn section, The Phenix Horns. 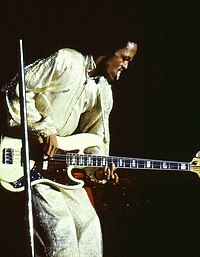 Verdine says he learned everything about the bass guitar from Louis Satterfield, and some of his early bass influences were James Jamerson, Paul McCartney, and Gary Karr. Moving toward a newly bought Fender Telecaster bass instead of the upright bass, Verdine began working the Chicago club scene with local bands. Meanwhile, brother Maurice, who was a former session drummer at Chess Records and a member of pianist Ramsey Lewis’s trio, had formed the Salty Peppers, scoring a local hit that caught the ears of Capitol Records. In early 1970 Maurice moved to Los Angeles, hoping to record the group, which he had renamed Earth, Wind & Fire and called up Verdine asking whether he would like to join, which he did, arriving in Los Angeles on June 6, 1970. As Earth, Wind & Fire's bassist since the band's inception, White has won six Grammy Awards, has been Grammy nominated seventeen times and has also been inducted into the Rock and Roll Hall of Fame and the Vocal Group Hall of Fame to name a few honors. The band has also earned more than 50 gold and platinum albums and have sold over 90 million albums worldwide. In November 2008 White was presented with Bass Player magazine's Lifetime Achievement Award by Nathan East. On Friday, February 26, 2010 Verdine was inducted as a member of Phi Beta Sigma Fraternity at the ceremony held at the Crowne Plaza Beverly Hills Hotel in Los Angeles, California. Verdine White holds an honorary doctorate degree from the American Conservatory of Music. White is the co-founder of the Verdine White Foundation which aims to provide musical education to underprivileged and gifted students. During 2007 he was as well inducted into the Boys and Girls Club's Alumni Hall of Fame. White lives in Los Angeles in a house built in 1919, with his wife of 35 years Shelly. She was once a member of R&B groups The Ikettes and Honey Cone and also has a twin sister by the name of Geraldine. ^ "The 100 Greatest Bass Players of All Time". bassplayer.com. ^ "BASS PLAYER LIVE! Lifetime Achievement Award Recipients". Bass Player Magazine. 2011-06-15. Retrieved 2011-12-17. ^ "PHI BETA SIGMA GOES HOLLYWOOD". pbs1914.org. Archived from the original on 2011-12-17. Retrieved 2011-12-17. ^ "The Verdine White Foundation". verdinewhite.org. Archived from the original on 20 August 2008. Retrieved 16 June 2009. ^ "2007 Annual Report - Inspiring a Generation". bgca.org. Retrieved 16 June 2009. ^ "Alumni Hall of Fame". bgca.org. Archived from the original on 1 June 2009. Retrieved 16 June 2009. ^ "Shining Star Verdine White". bassplayer.com. Archived from the original on 2006-03-25. ^ "Verdine White - Credits". allmusic.com. Retrieved 9 June 2009. Wikimedia Commons has media related to Verdine White. Verdine White Interview NAMM Oral History Library, January 20, 2014.